The Bagger Nation Original Ace of Spaded T-Shirt is a two sided print in black. 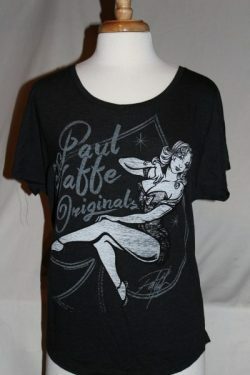 Front Design: Lady and text superimposed over the ace of spades symbol. Back Design: Small upper back same as the front. Hot Leathers Next Level 25% cotton, 25% rayon, 50% polyester scooped neck tee.